I know it has been a long time since I have been here to share with you. I never had any intention of letting so much time go by, but life has been busy. Also I was having some major computer issues. My wonderful 4-year-old MacBook, which I loved with all my heart had begun slowing practically to a complete stop anytime I would try to edit photos. It got so bad I literally wanted to cry and throw it out the window. I can have a smig of a short temper, so I have been told. The possibility of a projectile laptop was very. I had to rectify the situation and so this week I finally got around to upgrading my laptop. It’s beautiful, shiny and most important it is lighting fast, like Flash. What better way for me to take my new friend for a spin then to share a new recipe with you? 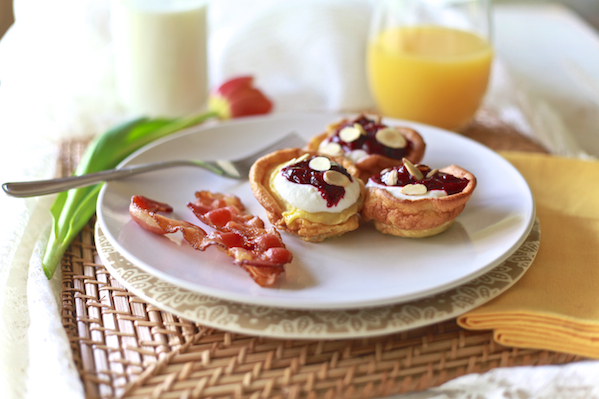 Not just any recipe but a Mother’s Day breakfast recipe. Because mother’s rock! And because mother’s (or mami’s) rock we should make them fancy little pancakes filled ricotta mousse and topped with tart cherries, in bed while giving them a foot massage. You heard me! Give them a foot massage…unless they are really ticklish because then she may accidentally kick you. My mother put up with a lot from me and my sister when we were kids. I know there were many times she wanted to pull her hair out. I know this because she told us so, but regardless what we did there was no question she loved us. 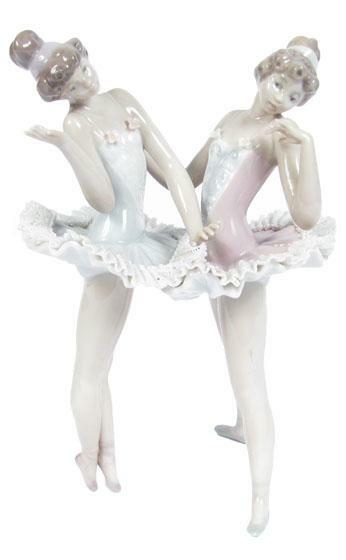 Sometimes we forget to say thank you to Mom, sometimes we break their favorite ballerina L’ladro figuring and sometimes we just plain take them for granted. 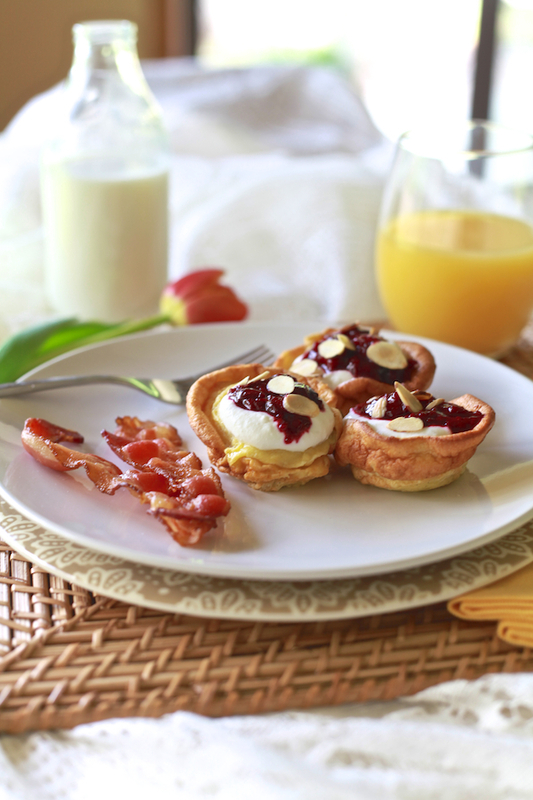 Make this Mother’s Day really special with this lovely little Dutch pancakes and remember Mom rocks! Here are some reasons my Mami rocks! She knows what to say and when not to say it. She, my sister and I all share the same laugh. She is never lost, she just doesn’t know where she is. She makes the best pollo fricassee. She supports me no matter what. She clucked like a chicken out the window at a kid sitting on a soccer ball. She says “e-schedule”, “e-special”, “e-spagetti”, etc…. 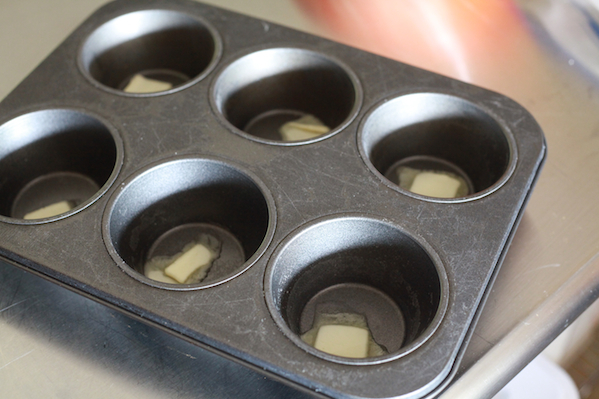 Preheat oven to 400 F. Place 2 large muffin pans (6 molds) in the oven while it preheats. Combine cherries, honey, sugar, lemon juice and vanilla in a bowl, stir until the cherries are evenly coated. Heat a large skillet over med-high heat. 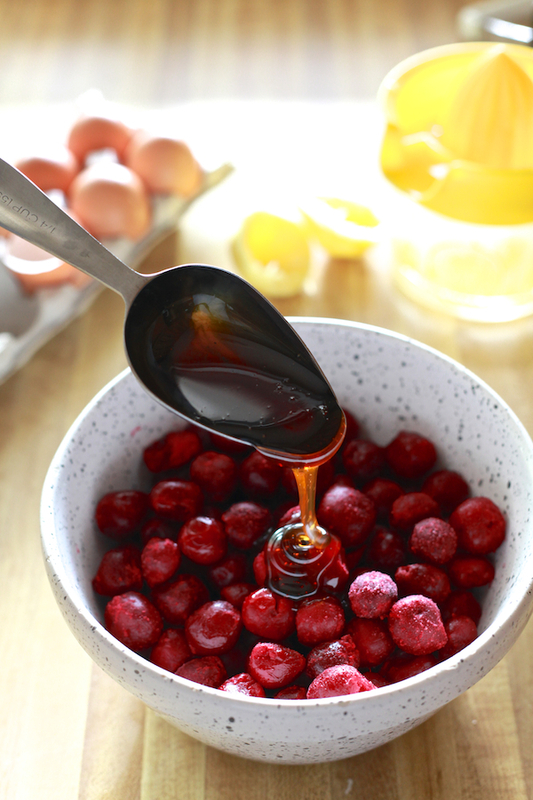 Add cherry mixture to the skillet, cook until tender and syrupy, about 10 minutes. Set aside. 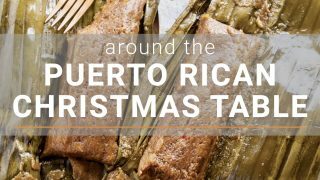 Using a stand mixer or electric beater, beat the ricotta and almond extract until smooth and creamy. 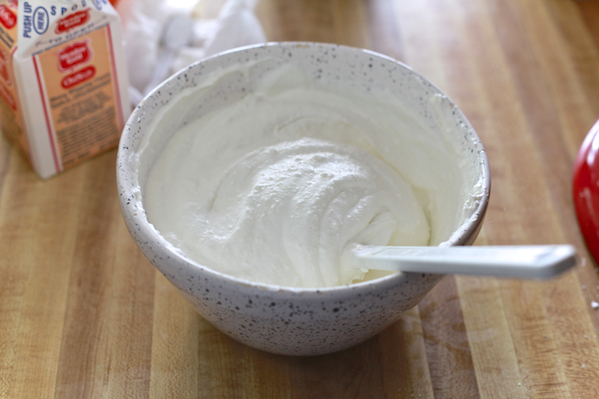 In a separate bowl, using a stand mixer with a whisk attachment or an electric hand mixer, whisk the cream until thick. Add the powdered sugar and continue to beat until the cream holds stiff peaks, being careful not to curdle. Working in batches, gently fold the cream mixture into the ricotta mixture, set aside in refrigerator. Whisk together eggs, vanilla paste, lemon zest and milk. Beat in flour and granulated sugar until well combined. Drop 1/2 tablespoon of better in each mold. Divide batter into the molds, filling less than half way. Bake until puffed and cooked through and tops are set and brown, 15 to 18 minutes. Serve pancakes filled with cherries, topped with a dollop ricotta mousse and garnished with toasted almonds. Combine cherries, honey, sugar, lemon juice and vanilla in a bowl, stir until the cherries are evenly coated. Heat a large skillet over medium-high heat. 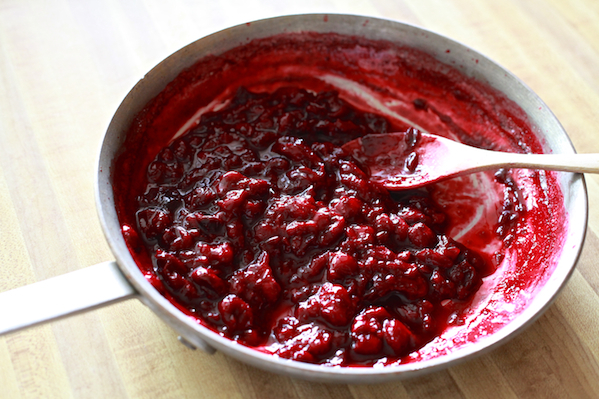 Add cherry mixture to the skillet, cook until tender and syrupy, about 10 minutes. Set aside. Using a stand mixer or electric beater, beat the ricotta, honey and almond extract until smooth and creamy. 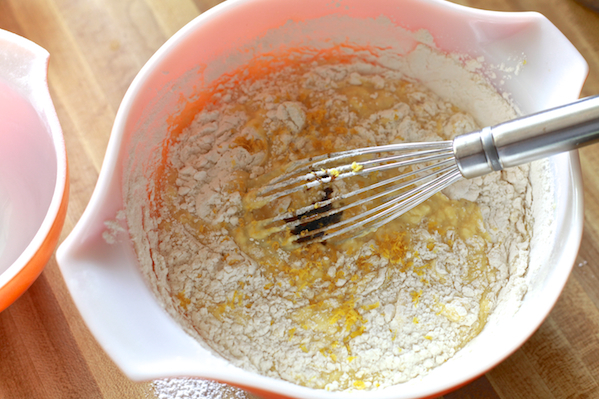 In a separate bowl, using a stand mixer with a whisk attachment or an electric hand mixer, whisk the cream until thick. Add the powdered sugar and continue to beat until the cream holds stiff peaks, being careful not to curdle. Working in batches, gently fold the cream mixture into the ricotta mixture. Once it's all combined, set aside in the refrigerator. 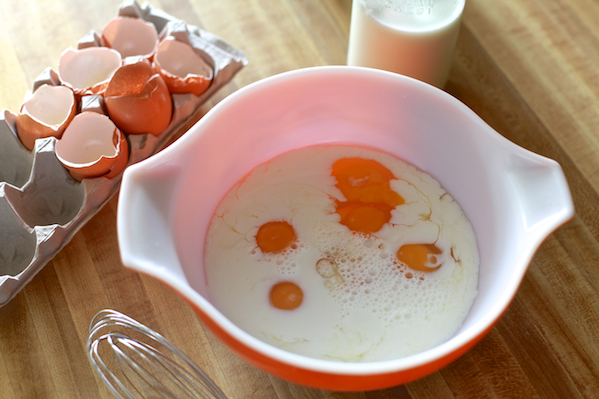 In a large bowl whisk together eggs, vanilla paste, lemon zest and milk. Beat in flour and granulated sugar until well combined. Drop 1/2 tablespoon of butter into each mold, let melt. 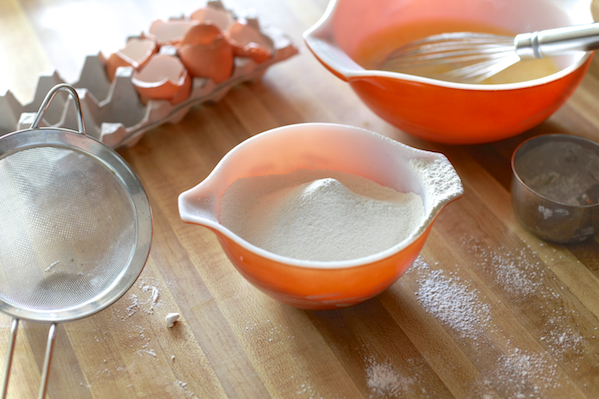 Divide batter into the molds, filling each less than half way full. 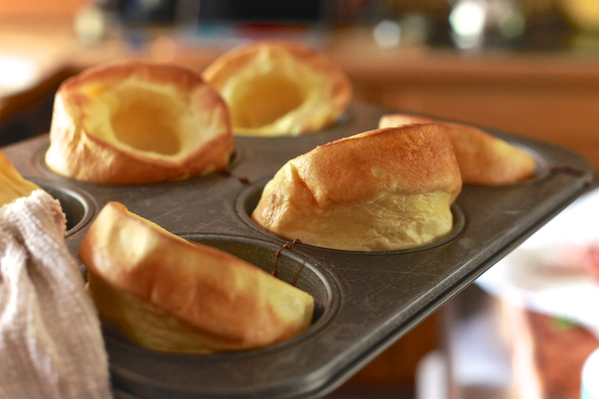 Bake until puffed and cooked through and tops are set and brown, 10 to 15 minutes. Serve pancakes filled with cherries, topped with a dollop of ricotta mousse and garnished with toasted almonds. Those look so lovely! I love the bright cherry sauce over the ricotta mousse. Definitely the perfect treat for spring! Such a nice tribute to your mom! 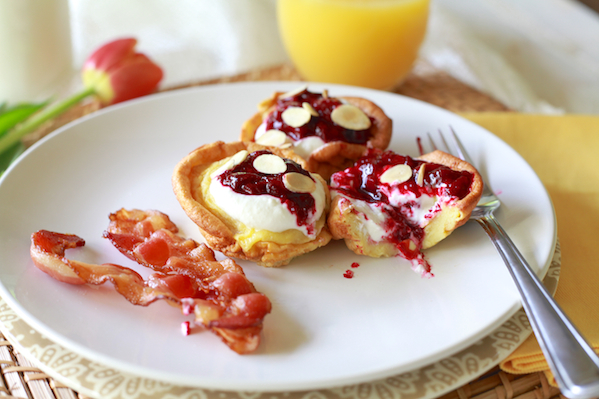 Your pancakes look gorgeous, I love that they’re mini and the cherry, almond and ricotta combination sounds delicious! That’s super sweet about your mom. Happy Mother’s Day!